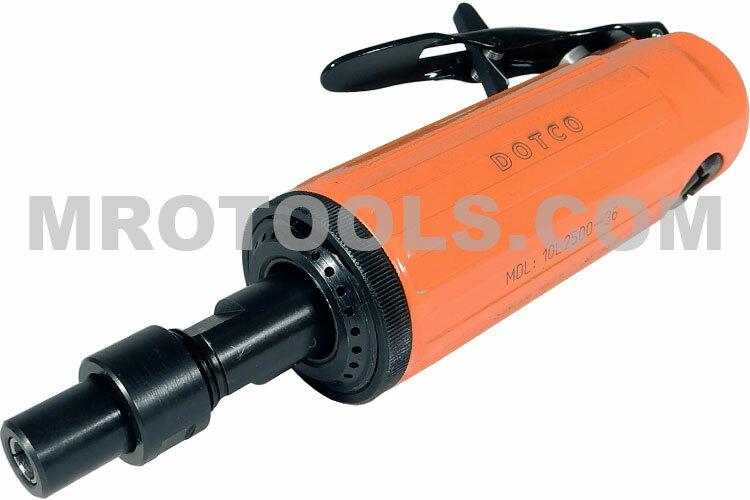 Dotco 10-25 Series Inline Grinder with 200 Series Collet is designed with durable aluminum housing and is designed to work comfortably with the operator. The Dotco 10-25 Series Inline Grinder with 200 Series Collet is compact, but with a powerful motor. Front and rear exhaust models are available. The 10B2500-01 Dotco 10-25 Series Inline Grinder with 200 Series Collet, Front Exhaust is one of thousands of quality tooling products available from MRO Tools. Please browse Dotco 10-25 Series Inline Grinders with 200 & 300 Series Collet for tools similar to the 10B2500-01 Dotco 10-25 Series Inline Grinder with 200 Series Collet, Front Exhaust. 10B2500-01 Dotco 10-25 Series Inline Grinder with 200 Series Collet, Front Exhaust description summary: Dotco 10-25 Series Inline Grinder with 200 Series Collet Exhaust: Front Collet Size: 1/4'' Free Speed (rpm): 23,000 Abrasive Capacity: 1'' Carbide Burr, 1.5'' Mounted Wheel Type Housing: Aluminum Weight: 1.4lbs / 0.64kg Overall Length: 6.3'' / 160mm Quantity discounts may be available for the 10B2500-01 Dotco 10-25 Series Inline Grinder with 200 Series Collet, Front Exhaust. Please contact MRO Tools for details.